"This is meant to substitute for that rather expensive Greek seasoning in the yellow and red can." Mix salt, garlic powder, basil, oregano, cinnamon, black pepper, parsley, rosemary, dill, marjoram, cornstarch, thyme, and nutmeg in a bowl. Store in an airtight container. Alternately, blend spices in a spice grinder for a finer texture. 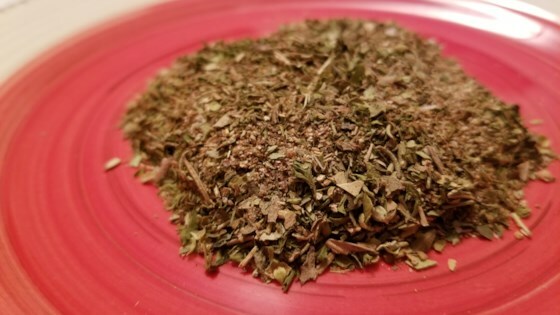 See how to make a mildly hot Cajun spice mix…for just about anything! This was... Odd. Very odd. Made it as directed. The nutmeg and cinnamon were by far the dominant smells of this before using and after cooking. Was awesome on a pork tenderloin. Mashed it all over the loin, seared it on high heat with olive oil and then roasted it until done. Rave reviews!